Anyone else out there a fan of podcasts? I admit I’m addicted and would rather listen to podcasts than the radio. It’s my go to when I’m getting ready, gardening, driving (by myself…most are not Sky safe subject and/or language), cooking dinner…really any time I’m doing something that allows me to pull up a cast and let it play while I’m busy with a task. Not reading though, I can’t read and listen at the same time. What I’m currently listening to. It all started with Serial season 1…about the Adnan Syed case, if you don’t know about it Google it, or listen to the podcast. It’s story telling, with a lot on the line, at its best! The case is ongoing and fascinating to follow. Serial season 2 is really fascinating as well, not about Adnan Syed, but still a very interesting story! Anyway, I listen to a lot of podcasts and thought I’d share my faves. First off I listen via Castbox a free app on my phone. There are a lot of options for listening, this is one I’ve used forever and it has all my faves/subscriptions on it, so it’s what I stick with. While this is a list of my current listens, it has changed over time. I’ve dropped some and added others, but for the most part these are my go-to casts that don’t change. –Break Down – The Atlanta Journal-Constitution’s Podcast covers stories that may or may not feature a break down in the justice system. It’s story telling with a bit of investigation mixed in, and some are told in real time, so you go through the prosecution/trial as it happens. The only down side is that because it’s real time there can be lengthy breaks in the seasons if trial is delayed for any number of reasons. There are several seasons already, so it’s a great binge listen. –Empty Frames – This is a truly fascinating listen. Tim and Lance, podcast hosts, have done a lot of research and dug up some interesting people to tell the story of an art heist at the The Isabella Stewart Gardner Museum, one of the largest art heists in history. (I listened to Tim and Lance when they launched their first podcast, Missing Maura Murray it’s totally worth a listen btw..super easy to get sucked in and frustrated by). Empty Frames is just a really good listen. It’s an unsolved case, with a lot of very interesting personalities involved, and a lot of speculation/assumptions. I would love to know what really happened! –True Crime Garage – Oh how I love Nic and The Captain! The banter back and forth is hilarious even while telly some pretty gruesome stories. There are not a lot of happy endings here, but for some reason I’m hooked. I can’t listen to this one when I’m running or walking alone, all I can think is “I don’t want to end up as a story for Nic and Captian”, but I do love listening to them. They crack open some beer, play some cool music, and talk about true crimes solved and unsolved alike. Super fun to listen too even though it’s a dark subject. –Undisclosed – From the site: The Undisclosed podcast investigates wrongful convictions, and the U.S. criminal justice system, by taking a closer look at the perpetration of a crime, its investigation, the trial, and ultimate verdict… and finding new evidence that never made it to court. Susan Simpson, Colin Miller, and Rabia Chaudry are attorneys that take a deep dive into wrongful convictions, and thanks to their efforts there are several innocent people that stand a very good chance of getting out of jail. I highly recommend this podcast for being so well rounded in educating listeners, investigating cases and finding new evidence, and ultimately giving hope to innocent inmates and their families. It’s truly astonishing to hear how badly the justice system can fail when it’s not functioning as it should, and I’m glad these three are taking on the system and helping people at the same time. I have learned so much listening to this cast. –Truth & Justice – Guys I love this podcast so much! Bob Ruff is the host and like Undisclosed got his start as a type of spin off from Serial. (The Adnan Syed case is that compelling)! Bob focuses on crowd sourced investigation of crimes that have resulted in wrongful convictions. Every case he’s taken on has produced new evidence and while none of the falsely convicted individuals have been released yet, there is one that being released within the next month or so, and several others that have filed motions for DNA testing on new evidence, filed appeals and are close to having convictions thrown out entirely. This podcast probably frustrates me the most. The level of corruption Bob has uncovered in certain areas is sick. Sadly the justice system doesn’t mean justice for all and this cast drives that home. But, it’s uplifting to hear about the hope Bob is giving to old cases and to know that justice it coming, even if it’s taking decades. P.S. Bob can be a little cheesy sometimes, but still love listening. –Awesome Etiquette – From their site: Lizzie Post and Daniel Post Senning cousins and co-presidents of the Emily Post Institute answer your questions about etiquette today in this weekly hour-long podcast. With advice based on consideration, respect, and honesty, Awesome Etiquette guides listeners through everything from traditional etiquette quandaries to everyday and emerging etiquette issues in the modern world. I had no idea I would have so many etiquette opportunities in my life, but this podcast has really helped me to stop and think how to handle certain situations, and I’ve even submitted questions that have been answered. The advice is practical with a lot of laughs mixed in. Also, this is one I can listen to with Sky around. She won’t sit and listen to it, but I don’t have to turn it down or pause if she’s in the room. –Coffee + Crumbs – I just started listening to this one a few weeks ago. I figured I should add a parenting type cast to my list to be well rounded. I have not listened to all the episode and don’t plan on it…I only have so much time. I did go back through past seasons and listen to the ones that I thought would be helpful/informative. I love their This Is How We Do…insert anything from birthday parties, to play dates. I enjoy the banter between the hosts and have picked up a few good tips! –Happier – The title sums it up! Gretchen Rubin shares her tips, tricks, life hacks and advice on how to live a happier life. I really enjoy this cast a lot. It’s very uplifting and it leaves a smile on my face. –Happier In Hollywood – Liz Craft (Gretchen’s (see above) sister also co-hosts Happier) is a TV writer in Hollywood. Liz along with her writing partner Sarah Fain share what it’s like to live in LA and write/work in Hollywood. Very entertaining and it’s been fun listening to them as they pitch a show idea and all the ups and downs of will the show get picked up or not. I won’t spoil it. Another cast that leaves me smiling and is really fun to listen to. –The History Chicks – Two friends who take you back in time to learn about influential ladies in history. The first several episodes are really hard to listen to, it was a new cast with not great sound editing, but it’s gotten so much better and I really enjoy the history lessons they provide. –Reveal – From the site: Created by The Center for Investigative Reporting and PRX, Reveal is public radio’s first one-hour radio show and podcast dedicated to investigative reporting. Credible, fact based and without a partisan agenda, Reveal combines the power and artistry of “driveway moment” storytelling with data-rich reporting on critically important issues. The result is stories that inform and inspire, arming our listeners with information to right injustices, hold the powerful accountable and improve lives. Truly great, fact based, story telling. Very enriching to listen to. –Embedded – From the site: Host Kelly McEvers takes a story from the news and goes deep. Whether that means digging into the Trump administration’s past, the stories behind police shootings caught on video, or visiting a town ravaged by the opioid epidemic, Embedded takes you where the news is happening. Another fact based cast that is telling the stories that are happening right now. I don’t watch the news, but I do listen to this and learn a lot! 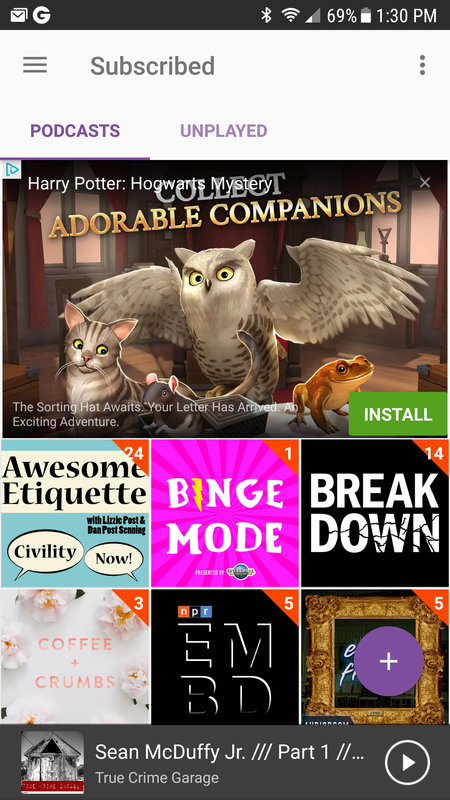 –Binge Mode – The link takes you to the Harry Potter Binge Mode series, but they have several “seasons” covering different shows/movies. I just couldn’t find a general link to all the topics they cover. I just started listening to this one, only on episode two of the Harry Potter Season and loving it. They take a deep dive into facts from the books, point out things that fans may not have picked up on, and speculate and/or ask questions that the rest of us are wondering about. If you are a fan of Harry Potter (I hear they have done Game of Thrones, Westworld, Star Wars and more) or any of the other topics they cover than this would be a fun cast to geek out to. Last but not leas is a kiddo podcast that Sky loves! Wow in The World is pretty great. Mark and I enjoy it as well, and all three of us have learned a lot. I tend to let the episodes build up and then we binge listen on longer road trips. Sky likes it so much she wants to re-listen to older episodes once we are all caught up. The two hosts are so engaging and full of comedic relief while sharing some pretty awesome scientific knowledge.